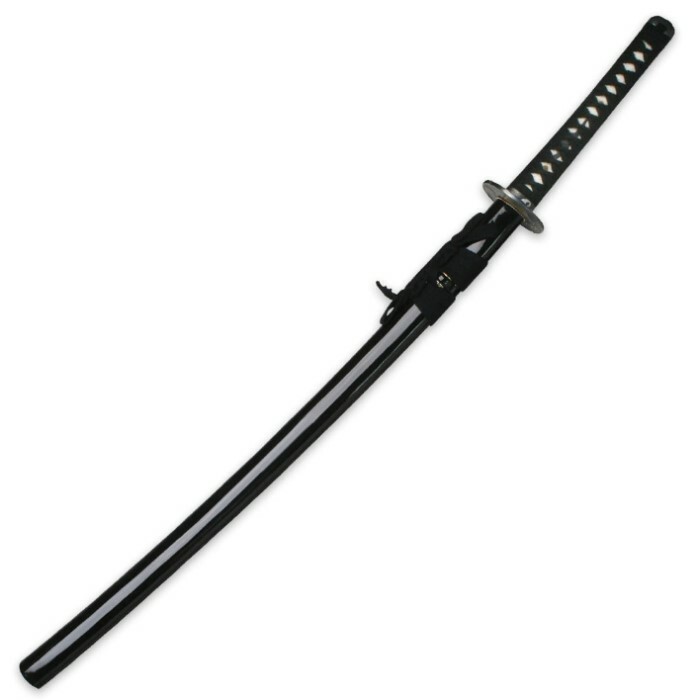 Expertly crafted with exceptional attention to detail, this Shinwa Japanese Katana sword features a massive 28.3" blade of hand-forged Damascus 10-fold layers of carbon steel. This traditional design offers a heavy blood groove spanning the massive blade and a hand-sharpened edge that will slice with ninja precision. Ornate details such as the oxidized zinc alloy tsuba, solid brass habaki and genuine ray skin tsuka (handle) with silk cord wrappings make this fully functional collectible katana sword a prized showpiece among collectors. The intricately designed tsuba features a Japanese Thunder God design. The hardwood scabbard has a high-gloss black lacquer finish with coordinating cord accents. Sword came sword sharp, the fittings are tight so far so good. I don't know what the "Damascus" folded steel is however when I used it to cut the cardboard box it came in the steel has scratched and the edge nicked so it must be a mild steel. The blade has a rotational warp so I'm not sure this is a battle ready sword. Be aware that this sword is ok for Kata not convinced its for fighting worth the price as long as you are not depending on it to fight. I just recently received this sword. First impressions were nothing more then excitement and pure awe. The Damascus steel had a really beautiful pattern and the fittings were all tight. This sword also performs so much better than my Musashi katana. With that being said the tsuba, hi, spacings and the ito wrap and all the aesthetics look amazing. Despite all this my particular one I received has some very sad cons to it. Mines came with the spacings between the cord not very evenly spaced out. On one side of the wrap you can see the real ray skin yet you can see they didn't use the full ray skin wrap, just partially. The ito also has a chunk of the cotton flared out, it probably got caught on something in the factory and pulled it out. Despite these issues the sword is fine and it can easily be over looked. However one issue I can't seem the get over is near the lower part of the blade, where the cutting edge is, there is a very noticeable dent. This kinda made me sad but like I said, it is only on mine. 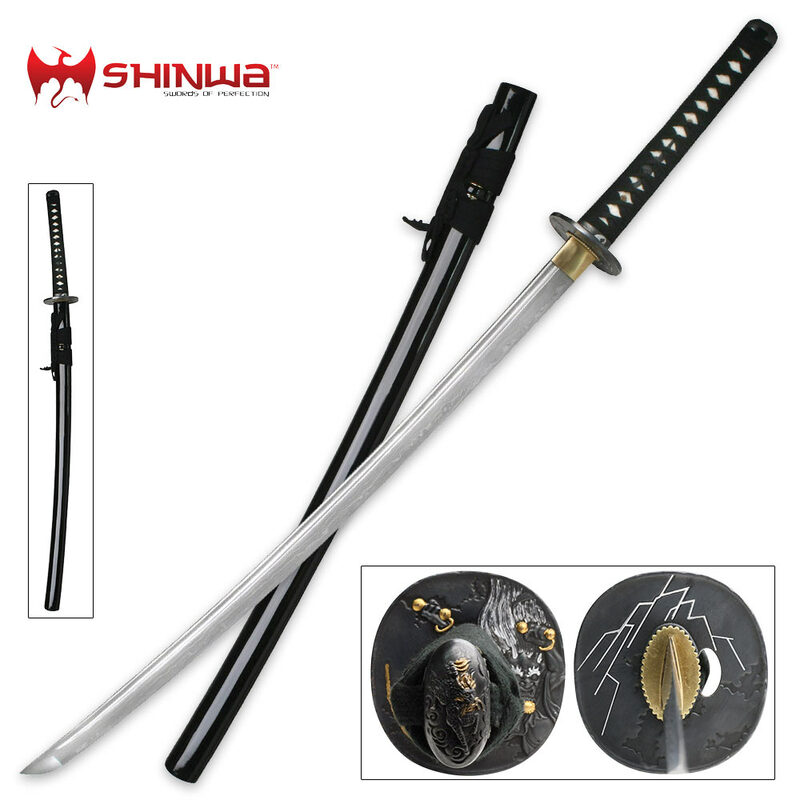 Don't let this particular katana deter you from purchasing this sword. You will not be disappointed. First i must say, I absolutely love this sword. I plan to have some cutting tests with it, but tested it on paper, it is super sharp. Only bad things I see, are very minor, first the tsuba is bent up just a little bit so it gives a slightly slanted straight on look, second, the blade is bent ever so slightly but it's right there and i can't overlook a bend, easily fixable however. And finally, third, the tsuba's thunder god, and lightning bolts are only partially painted, it's like someone said screw it and just stopped. Overall, this is such an amazing work of art, and i am very glad i have hold of it now, the layers in the blade are exquisitely beautiful and breath taking, this is a gorgeous piece good for collection and well made to hold an edge and cut through some pretty tough targets. I am very pleased with this beauty.